We Were the First Air Conditioned Dog House! Over fifteen years ago, Blythe Wood Works was the first dog house manufacturer to market air conditioned dog houses. It's been a learning experience for us; the most important lesson learned - listen to the customers. They relayed to us that they desired an air conditioned dog house that had an air conditioning system with a better warranty and a longer life. Some customers wanted a dog house with AC only, others wanted their dog house with heat only and some desired both. 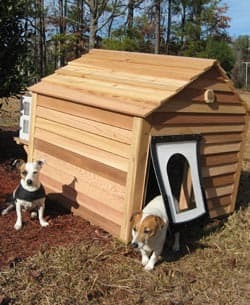 There are geographical areas that have extremely hot climates, like Texas, Arizona, California and Florida, where the "huge" doghouses need more btu(s) during those 100 plus degree days. We investigated many different air conditioners by a number of manufacturers, and have chosen a 5,200 btu, ENERGY STAR rated unit that meets all of the requirements of our dog house with AC. It's so efficient, when it reaches the optimum temperature, the entire unit shuts off completely, so no energy is wasted. We have tested and adapted it to fit our dog houses from the Large Cedar Dog House to our largest house, the Goliath Cedar Duplex and it performed flawlessly, cooling them in just 3 to 5 minutes. If someone requests the need for heat, we offer a full line of heated dog house pads. For those very cold climates, we have a thermostatically controlled electric dog house heater available, we even offer a discount if you need more than one. We're sure you'll find the prices of our dog house with AC to be the best available! When you order one of our dog houses, choose the option for the DogAire™ system if you'd like to cool your dog house. During the setup process the unit can be installed by the customer in less than two minutes. The unit connects directly to the house, there are no hoses, clamps or holes to be bored, and no hoses to chew on! We totally prepare your dog house for the AC unit at no extra charge. The DogAire™ can not be purchased separately from the dog house because we custom build the house with extra framing to stand up to the weight of the air conditioning unit. In addition, we build a custom platform to hold the air conditioner to the side of the house. When you order a dog house with AC, the finished house has a large hole in the rear panel where the DogAire™ will be installed. Included in the cost of the DogAire™ is the extra labor and materials required for the air conditioning unit to be installed in the house, and which make it super easy for you, the customer, to install. Shipping is also included in the cost of the DogAire™. Since it can not be shipped ground by either FedEx or UPS, we build a pallet for it and strap it down so it can not be turned over or be mishandled in any way. It is shipped common carrier with your dog house. If you are considering an air conditioned dog house using the DogAire™ system, we recommend the insulation option, along with the Seal Safe™ door, especially for larger houses with multiple dogs. The DogAire™ will run more efficiently and the savings in electrical usage will pay for the Seal Safe Door™ in just two or three years.